Each classroom consists of days filled with exciting opportunities for group and individual activities. The children enjoy outdoor play and indoor play. Upon arriving at school, the children may freely choose activities which are well displayed in a carefully prepared classroom where the shelves are at the child’s level for easy access. These activities pertain to daily life, including care of self and the environment. We encourage social grace and courtesy which will lead to the development of personal independence, problem solving and respect for both them and the community. It is through manipulation of the concrete materials that the child comes to learn the basic essentials of mathematics, language and the world in which we live. Please take a few minutes to view this video explaining how well Montessori works for children. The Practical Life area provides children with the opportunity to perform tasks of everyday life. 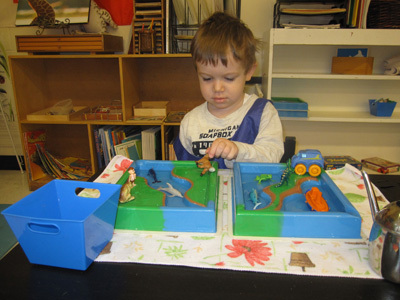 The overlying purpose of this work is the development of independence and control and coordination of movement. 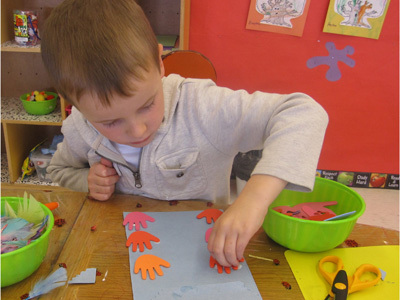 The children learn to work at a task from beginning to end and grow in their ability to concentrate. The Culture area of the classroom encompasses a variety of subjects. Cultural subjects include: History, Geography, Zoology, Botany, Science and Art & Music. Studying Geography allows the children the opportunity to understand their own culture as well as many others. 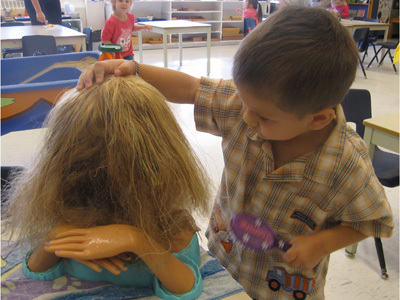 The Sensorial area of the classroom helps children become more aware of smaller details that are often overlooked. Each sensorial activity focuses on one important quality such as color, weight, shape, size, texture, sound or smell. The Art area We have and extensive creative art area. It is set up in a way that allows the child to express his/her own creativity with access to many mediums arranged and a well prepared setting with plenty of room to get creative. The Language area of the Montessori classroom encourages development of early-literacy skills through the use of phonetic sounds. 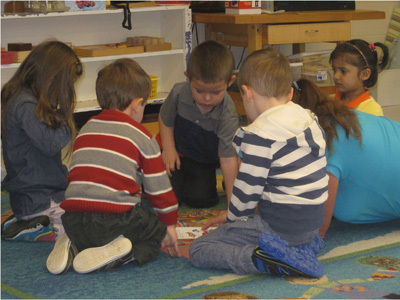 Montessori Language activities are designed to improve a child's vocabulary, listening skills for common sounds, and differentiating between objects and pictures. The Library area is located in a quiet cozy corner of the classroom. 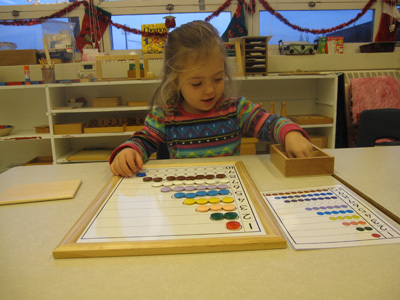 The Math area of the Montessori classroom encompasses the use of concrete materials for the recognition of numbers and the recognition of quantity as well. This work gives the child a solid understanding of basic mathematical principles. 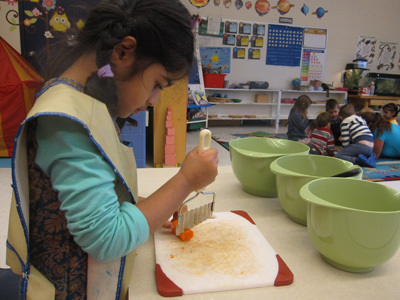 Culinary: The children learn to prepare and serve foods to their peers. We also have a block area and a house keeping area. Starting in January, we will be offering the following.